Happy Monday everyone! Wanna know something Marvelous in My Monday? 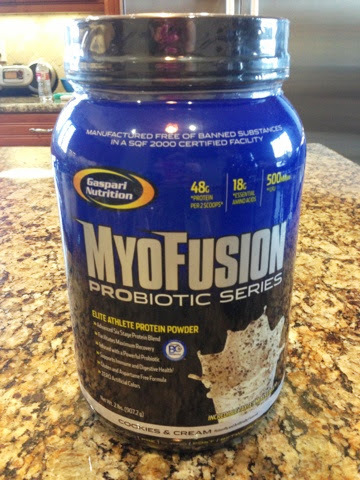 This is my 7th MIMM post - I got 2 new tubs of Gaspari MyoFusion protein powder recently from vitacost.com and wanted to review them for you! I have a sensitive stomach, as I am sure a lot of my blog readers do too. Some protein powders hurt my stomach and leave me feeling really uncomfortable. I was recommended to the MyoFusion proteins by several friends who liked them. I had also heard they were good for baking with. Sold! In the past I have tried their Peanut Butter Cookie Dough, and their Cinnamon Roll. The PB one tastes great in oatmeal, and the Cinnamon Roll was my favorite to use for a slushy creamy protein shake. I recently got the chance to order some new stuff from vitacost.com - and I had actually gone through my other 2 whole tubs of protein powder! I feel like I should look like superwoman by now at least. I cruised the site, and decided to try 2 new flavors that I had not tried before, and probably wouldn't normally order. I picked these 2 - Gaspari Nutrition MyoFusion® Probiotic Series Protein Powder Cookies and Cream and Gaspari Nutrition MyoFusion® Probiotic Series Protein Powder Banana Perfection -- 2 lbs. Vitacost.com has amazing prices too - you actually save 43% off the normal retail price, when you order from their site. 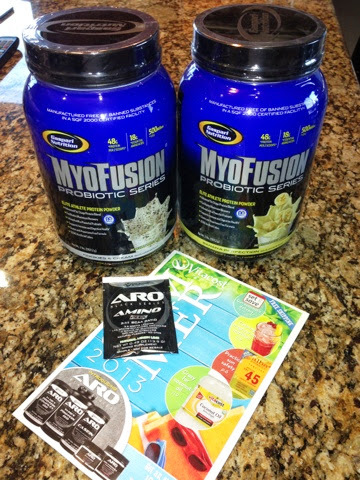 Here is what I got in the mail - the 2 protein tubs, a free sample of an amino supplement, and a summer catalog. Shipping was super quick as well. MyoFusion® Probiotic Series is a revolutionary protein formulation with a highly potent blend of six amino acid packed sources of protein. To further enhance the revolutionary formula is the durable and patent protected GanadenBC30® (Bacillus coagulans GBI-30 6086) probiotic. This advanced probiotic is strong enough to survive manufacturing, doesn't require refrigeration, is shelf stable, and survives stomach acids to deliver beneficial bacteria to your digestive system. Real athletes not only need support for recovery, but must also consider JUST THE FACTS to support their healthy lifestyles. This is why MyoFusion® Probiotic Series has set the new standard for high quality proteins for all elite athletes and health enthusiasts around the world. Advanced six stage protein blend, Patented GanedenBC30 (Bacillus coagulans GBI-30 6086) Probiotic to support immune and digestive health, Features Whey Protein Concentrate, Brown Rice Protein Concentrate, Whey Protein Isolate, Milk Protein Isolate, Egg Albumin and fast acting Whey Protein Hydrolysate, Over 9 grams of essential Amino Acids (EAAs) to support recovery, Gluten and Aspartame free formula. And, for the nutrition facts, actually the cookies & cream facts need to be updated - the sugar count is only 3! It looks like they missed the protein count. Banana is listed correctly though - 150 cals for 2 scoops (and I only use 1 scoop, so 75 for me, 2 grams of fat for me, 105 mg sodium, 4.5 grams of carbs, 1.5 sugars, and 12 grams of protein - so 24 grams in 2 scoops. Maybe I will start using 2 scoops! Here is the cookies & cream photo - I give it a 9! I only give it a 9, because I love the Cinnamon the best so far. But seriously, I used 1 scoop of this, about a cup of unsweetened almond milk, a pinch of Truvia, 5-6 big ice cubes, mixed it up with my NutriBullet, and IT TASTED LIKE AN OREO COOKIE SHAKE. I am not kidding. It was super super good! And my boyfriend James said he actually liked his shaken up with water better because of the little "cookie" peices that you can chew - that get blended in the blender. Delish. I am sure that since James likes this too, we will run out fast! I think it would also taste awesome in oatmeal, so that is my next taste test to do! And, this protein does not hurt my stomach or make it crampy at all - so that is a really huge part in why I will keep using it, too. Here is the Banana protein and a picture of the shake I just made today for an afternoon snack - same ingredients as I listed above for my cookies n cream shake, but with this protein. Yum again! I give this one an 8. I would have never guessed a banana protein would taste so good! It tastes like a thick shake you would get at like Orange Julius or something. It tastes like I mixed banana pudding mix in the shake and I didn't! I can't wait to try this one baked in muffins and protein pancakes (see my infamous recipe here). I am so glad I decided to try something outside of my comfort zone, and would definitely buy this from vitacost.com again! I hope you liked my review! 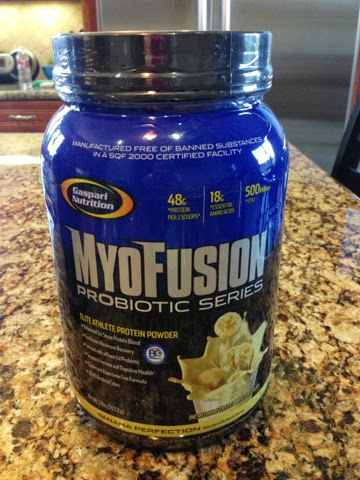 Have you ever tried MyoFusion protein? Do you have any yummy protein powder recipes you would like to share? Anything else I should try out from vitacost.com? Here is a link where you can sign up for the website if you haven't already! And, you get $10 for signing up! Have a great week, and I hope you liked the review! By far my FAVORITE protein powder. You must try the cinnamon bun flavor.. So good! 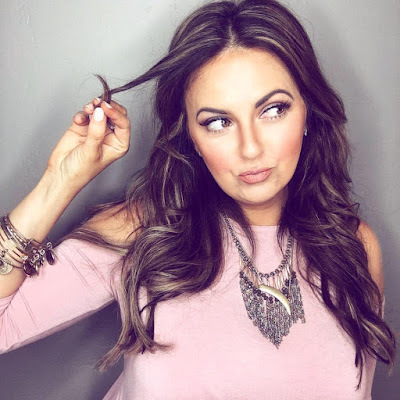 Have you tried Isofusion yet? So good. Another delicious protein powder to try is CLICK. They have vanilla latte and Mocha. Ooh, what is Isofusion and CLICK? I do love the Cinnamon Myofusion too!! Will do, thanks for the love!